Are you visiting Norway for birding? Then you have come to the right place! 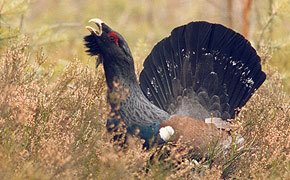 Birding Norway is an offer for those who don't want to waste any time searching for the best birding sites. Experience Norwegian birdlife on guided tours and daytrips from several of Norways major cities. If Norway is included in your holiday plans, why don't you check out what Birding Norways guided tours have to offer? We pass through breathtaking scenery while driving from one birding hotspot to another, and focus on Scandinavian specialities as well at the longest possible triplist. Updated November 25th: Several rarities have been found during the last month. Good birds like American Wigeon, Pallid Harrier, Ivory Gull, Pallid Swift, Blyth's, Olive-backed and four Water Pipits are among the better records. The invasion of Pine Grosbeaks peaked on the 9th, when more than 1200 birds were counted.